It was Wednesday evening, October 22, 1975, Game Seven of the greatest World Series ever played. The Big Red Machine from Cincinnati faced the Boston Red Sox the night after an amazing Game Six marathon won by the Red Sox in dramatic fashion on Carlton Fisk’s home run leading off the bottom of the 12th inning. The Reds were heavily favored, as they had been in the 1970 and 1972 World Series, as well as the 1973 NLCS, all of which ended in a loss. The Reds were the team of the 1970s, but by the middle of the decade they had yet to win a World Series. The pressure was on the city, the organization, and the players. For Game Seven the Red Sox had all the momentum and it appeared that the Reds were going to lose in the postseason for the fourth time in five years. Boston took a 3-0 lead in the bottom of the third against the Reds’ ace, Don Gullett. Bill “Spaceman” Lee was still shutting out the Reds with two outs in the top of the sixth inning when Tony Perez stepped to the plate. He was 0-for-2 and had struggled throughout the Series. He had started the Series 0-for-15 with seven strikeouts up to his second at-bat in Game Five. However, he kept smiling despite friendly ridicule by his manager and teammates, who knew him as Mr. Clutch for the Reds throughout his 12-year career. Perez faced Lee with Johnny Bench on second base by virtue of a hit, a force play, and a throwing error. The count on Perez was 1 and 0 and Lee, hoping to catch Perez off guard, threw a slow overhand curveball (nicknamed the “Leephus”). But Perez double-clutched before he connected and the ball soared into the night over the left-field wall. The Reds now trailed by only a run, and suddenly the momentum had shifted. The Reds tied the game in the seventh and won it with a run in the ninth for Cincinnati’s first world championship in 35 years. The team of the 1970s had made their mark and their future Hall of Fame first baseman had turned the tide in their favor with a big swing of the bat. Atanasio (Rigal) “Tony” Perez was born on May 14, 1942, in the town of Ciego de Avila in Camaguey, Cuba. As a teenager he worked with his father in a sugar factory putting stamps on packages, but he described his life in those days as being about “school, work, and baseball, and baseball was what you lived for.” He had one sister and one brother and his family teased him about becoming a professional baseball player, telling him he was too skinny (nicknaming him Flaco, Spanish for skinny), and saying he would spend his life working in the factory like his father and brother. He played shortstop for the factory team, batted and threw right-handed, and stood 6-feet-2 and weighed 155 pounds. Despite his family’s jibes, in 1960 teenager Perez signed with the Havana Sugar Kings of the International League. The team was owned by a prominent businessman, Bobby Maduro (the “sugar king” of Havana). Havana had a working agreement with the Reds, who became interested in Tony. He left Cuba for the United States just before Fidel Castro restricted the ability to travel out of the country. Perez was criticized leaving his country to play baseball, but the political climate caused tremendous additional anxieties for young players, and Perez’s love of baseball forced the tough decision to leave his family and his home knowing that he might not ever be allowed to return to Cuba. He was inspired by Minnie Miñoso, a fellow Cuban who had a successful major-league career between 1949 and 1964 (with cameo appearances in 1976 and 1980). The Reds signed Perez without a signing bonus and just for the price of a plane ticket and a $2.50 exit visa. During his first few offseasons he went home to Cuba, but it was becoming more and more difficult to leave the country on time for spring training, so by 1963 Perez began spending the offseason in the United States and eventually in Puerto Rico, not returning to Cuba again until 1972 to visit his parents. Perez broke in with the Reds as a third baseman but his throwing was erratic (31, 42, and 30 errors in his first three minor league seasons), and eventually the Reds moved him to first base. His professional baseball career started with Geneva in the Class D New York-Pennsylvania League in 1960, and fielding problems aside, it was clear that he had great ability. In 1961, just 19, he returned to Geneva and broke out as a hitter (.348, 27 home runs, 132 RBI, 110 runs scored). Perez moved up to Class B Rocky Mount (Carolina League) in 1962 and was hitting .292 with 18 home runs when he broke his leg and missed the last several weeks of the season. In 1963 he was moved up to Macon of the Double-A Sally League and hit .309 in 69 games, though his home-run total fell to 11. He spent the end of the season with Triple-A San Diego, where his manager, Dave Bristol, urged him to gain weight in the offseason. Perez picked up more than 40 pounds, returned to San Diego in 1964, and batted .304 with 34 home runs and 107 RBIs, earning him the Pacific Coast League’s Most Valuable Player award as well as a call-up to the Reds in late July. He made his major league debut on July 26, 1964, against the Pittsburgh Pirates at Cincinnati (he walked in his first at-bat and went 0-for-2). Perez went on to appear in 12 games, playing first base in six of them and pinch-hitting in the rest. He was just 2-for-25 but was in the big leagues to stay. During the next two seasons Perez platooned at first base with Gordy Coleman. He showed some power and clutch production. He was moved to third base in 1967 to make room for a first base prospect named Lee May, and much to Perez’s surprise Los Angeles Dodgers manager Walter Alston named him to the National League squad for the All-Star Game in Anaheim. Perez entered the game in the tenth inning, struck out in his first at-bat in the 12th, and then, in the 15th inning he hit a one-out home run off Catfish Hunter to give the National League a 2-1 victory. Perez was voted the game’s most valuable player. (In an article in Baseball Digest in 1974 – before he hit his shot against the Red Sox – Perez named this “the game I’ll never forget.”) Perez wound up 1967 hitting .290 with 26 home runs and 102 RBIs in 156 games. His 102 RBIs began a string of 11 seasons in which he drove in at least 90 runs, and his All-Star Game appearance was the first of seven. In 1968 Perez batted .282 with 18 home runs and 92 RBIs and in 1969 he batted .294 and blossomed as a power hitter with 37 home runs and 122 RBIs. Perez was now an established star in the prime of his career, playing for an emerging powerhouse of a team that would soon take the baseball world by storm. After the 1969 season the Reds had hired an obscure minor-league manager named George “Sparky” Anderson, and under Anderson the 1970 team got off to one of the best starts in the history of baseball. After 100 games the team’s record was 70-30. Perez and Bench were leading the way to this historical season. Perez topped his previous year’s figures with a .317 batting average, 40 home runs, and 129 runs batted in. On July 16, Perez hit the first home run at Pittsburgh’s new Three Rivers Stadium. He finished third in the National League in the voting for the Most Valuable Player behind his superstar teammate Johnny Bench and the Cubs’ Billy Williams. After their sensational start the Reds played just over .500 ball the rest of the way but won 102 games and defeated the Pirates in the NLCS to capture the pennant. Then they lost the World Series in five games to the Baltimore Orioles and their dominant pitching (Perez was 1-for-18 and failed to hit a home run or drive in a run), and the amazing defensive play of Orioles third baseman Brooks Robinson. The expectations for Perez and his teammates were now extremely high. Perhaps not surprisingly, the Reds finished tied for fourth in the National League West in 1971 as several of the stars were injured at points during the season. Perez was solid, if unspectacular, hitting .269 with 25 home runs and 91 RBIs. Perez moved back to first base in 1972 after the Reds traded the slugging May in the offseason and acquired infielder Denis Menke from Houston in the trade that also got them second baseman Joe Morgan, pitcher Jack Billingham, and outfielders Cesar Geronimo and Ed Armbrister.) Tony remained a first baseman or a designated hitter for the rest of his career. Bench won his second MVP award and Perez hit .283 with 21 home runs and 90 RBIs in 1972. The Reds won the NLCS over the Pirates for the second time in three seasons, but disappointingly lost the World Series in seven games to the Oakland Athletics. Perez hit .435 in the World Series (10-for-23), but again failed to hit a home run and drove in only two runs. The Reds won the National League West again in 1973 (Perez batted .314 with 27 home runs and 101 RBIs), but fell to the New York Mets in the NLCS. Perez struggled again in the postseason, going 2-for-22 (.091), but one of his hits was a home run. The team now had a great mix of speed and power, but did not seem to have the depth of pitching that the Orioles, Athletics, and Mets trotted out in stifling the Big Red Machine in three of the last four postseasons. And in 1974 another pitching-rich team, the Dodgers, beat out the Reds by four games for the NL West title. Perez’s batting average dipped to .265, but he hit 28 home runs and drove in 101 runs while making his first All Star Game in four years as a reserve. Despite his clutch play and power, there was discussion of trading Perez. Still, despite the trade talk, Perez’s teammates considered him a leader of the team, referring to him as Big Dog or Doggie. In 1975 the Reds got off to a slow start, and stood at 19-19 in mid-May. Critics said they did not have the pitching to win a World Series, Perez was past his prime, Bench could not continue to catch nearly every game, Morgan was good, but not great, Anderson pulled his pitchers too soon and could not lead this team of stars to the ultimate goal, and the team did not have a skilled third baseman. Eventually Anderson moved Pete Rose to third base to make room for a young power-hitting outfielder named George Foster, and something magical happened as the Reds dominated the rest of the league on their way to a final record of 108-54, beating out the Dodgers by an amazing 20 games in the NL West. Morgan became a superstar, winning the National League MVP (making him the fourth Red to win the award in the past six seasons of the decade; Rose was a star at his fourth position; Bench continued to star; the pitching turned out to be very good after all as Gullett, Billingham, Gary Nolan, Rawly Eastwick, Clay Carroll, and others emerged as a cohesive staff; the gold gloves of Bench, Morgan, Dave Concepción, and Geronimo up the middle were unprecedented; Anderson was a genius after all, and Perez was consistent on and off the field as always. The teammates did not always get along; there was some jealousy among them as to who were the best of the best. But Perez kept them all together and loose. He was an agitator and made fun of his star-studded teammates as relentlessly as he drove in runners in scoring position. Concepción and Geronimo looked up to him as a great Latino player, while the others looked to him for veteran leadership. Perez related to both the star and non-star players and made them all feel part of the team. On the field he was the same consistent offensive force. He hit .282 with 20 home runs and 109 RBIs. The Reds swept another good Pirates team in the NLCS. Perez had his best NLCS, batting .417 with a home run and four RBIs as the team roared to the World Series. A fellow Cuban emerged as the early star of the Series as Luis Tiant shut out the Reds in Game One. Was it to be another disappointing Series with the other team’s pitching dominating the Reds’ all star line-up? The offense sputtered in Games Two and Three, but managed to pull out one-run victories in each before Tiant beat them again in Game Four, throwing an amazing 163 pitches. At this point Perez appeared washed up after failing to get a hit in the first four games and striking out seven times. However, in Game Five he homered twice and drove in four runs as the Reds took the lead, three games to two. The epic Game Six went to the Red Sox in extra innings on Carlton Fisk’s walk-off home run. Then Perez emerged again with his uplifting home run in Game Seven, and the Reds wound up winning the decisive game. Perez was the leader, the key to the machine running smoothly, the venerable veteran who finally had a World Series ring. Though he hit only .179 in the Series, he showed clutch hitting at its finest by driving in seven runs. Perez played for the Expos from 1977 through 1979. For the three seasons he hit .281, with 46 home runs and 242 RBIs. He left the Expos as a free agent after the 1979 season and signed with the Boston Red Sox, the team he had helped conquer in 1975. He hit .275 with 25 home runs and 105 RBIs in 1980 but he struck out 93 times and grounded into a league-leading 25 double plays. That year he received the Lou Gehrig Memorial Award from the Phi Delta Theta fraternity (Gehrig’s fraternity at Columbia University) for integrity on and off the field. The 1980 season was the last in which Perez appeared in more than 100 games. He played with the Red Sox for two more seasons, frequently as a designated hitter, before being released in November 1982. Perez signed with Philadelphia in January 1983 in time to be part of the Phillies’ pennant winners and being reunited with former teammates Rose and Morgan. Perez batted .241 with six home runs in 91 games. He started two World Series games as the Phillies lost the Series to Baltimore in five games. After the season Perez came full circle – the Phillies sold him to the Reds. By now in his 40s, he was a bench player for the Reds for the next three years. The team was long past its Big Red Machine days. Perez was reunited with Rose again in August 1984 when Pete returned as a player-manager. Perez played in just over 70 games each of his three seasons. Two of the seasons were mediocre, but in 1985 he hit .328 with six home runs and 33 RBIs. Perez retired as a player after the 1986 season. His career batting average was .279 with 2,732 hits and 379 home runs. He played in five World Series and was a seven-time All-Star. In 2000 Perez was inducted into the Baseball Hall of Fame. (He had been inducted into the Reds Hall of Fame in 1998 and his number 24 was retired by the Reds in 2000.) Though he will always be first remembered as a Cincinnati Red, he was the first player elected to the Hall of Fame who had played for the Montreal Expos. Perez was a coach for the Reds from 1987 to 1992. He started coaching under Rose and continued during Lou Piniella’s tenure as manager that included the 1990 world championship season. In 1993 Perez was named the manager of the Reds, but was inexplicably fired after 44 games with a record of 20 and 24 and replaced by Davey Johnson. The Reds were in fifth place in the National League West when he was fired, and remained in fifth under Johnson. In late-May 2001 he succeeded the fired John Boles as manager of the Florida Marlins as they finished fourth in the National League East. Jeff Torborg succeeded him in 2002 and Perez became the assistant to the general manager. As of 2012 Perez had been married to his wife, Petuka, for almost 50 years. Both of their sons, Victor and Eduardo, played professional baseball. Eduardo played for the Angels, Reds, Cardinals, Devil Rays, Indians, and Mariners from 1993 to 2006 except for a season in Japan in 2001. He also was a baseball analyst on ESPN and was the hitting coach for the Marlins in 2011. Victor played in 1990 for the Reds’ Billings farm team in the Pioneer League. Tony Perez and George Vass, “The Game I’ll Never Forget,” Baseball Digest, August 1974. 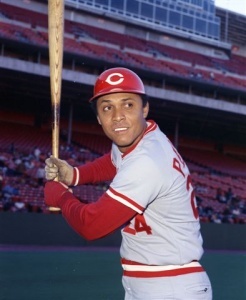 Tony Perez – Latino Legends in Sports, http://latinosportslegends.com/tonyperez.htm, downloaded February 21, 2011.